The style of tattooing known as American traditional, or old school, has become sort of the poster child for what many people think of when they think of tattoos. It’s easily identified with big, bold black outlines, a limited color palette, and a number of iconic images. American traditional tattoos can be traced back as far as the late 19th century, but it didn’t truly hit it’s stride until the 1960’s, when former sailor and tattoo enthusiast Norman Collins, aka Sailor Jerry (as in the rum brand), opened his shop in Honolulu, Hawaii. After spending many years as a sailor in Southeast Asia, Collins studied Japanese-style tattooing from the old masters, though he learned in Chicago from local legend Gib “Tatts” Thomas. While corresponding with Japanese tattooers, Collins developed his own iconography and style, which is still the standard today. His styling’s can still be seen throughout many tattoo shops flash sheets. Flash sheets were created to cater to the most common customer requests. A person could just walk in a shop, point to a tattoo on the flash sheet, and walk out an hour later with it. The idea was to churn out as many tattoos as they could. This is where American traditional developed its simple color palette and bold outlines. They were easy to knock out quickly. Each American traditional tattoo has a special meaning, not only to the person wearing it, but in the general tattoo canon. Here are just some of the most famous. This one is a bit obvious, but the bald eagle is a popular traditional tattoo for people who are American and proud of it. The national bird has been a popular tattoo subject in American traditional tattooing for most of the style’s existence. The bald eagle is both graceful and tough, making for an image as starkly fierce as it is iconic. The swallow tattoo is noteworthy for both its symbolism and superstition. According to one legend, each swallow tattoo was a symbol of a sailor who has sailed 5,000 nautical miles, an impressive feat in the early days of sailing. Another legend says that since the swallow returns to the same place every year to mate and nest, having a swallow tattoo guaranteed a sailor would return home. The sailor would get the first swallow tattooed before shipping out and get the second upon his return. This legend also contributes to many getting it as a romantic tattoo, a promise to always return to the person they love, just as the swallows do. A symbol of what keeps a person grounded and steady. Many people who get this tattoo have someone in mind when they get the tattoo, their proverbial “anchor.” That’s why so many choose to have the tattoo with the name of a loved one, traditionally “mom,” to keep the ones that keep them grounded close (though if I got “mom” tattooed on me, my mom would probably still hate it). Stylized in an infinite number of ways, skull tattoos can have any number of meanings depending on the affectations the artist adds to it. In the early days of American tattooing, these tattoos were popular with sailors, mercenaries, and adventurers, people who brandished their lack of fear of death or had to come to terms with the inevitability of it wore these tattoos. Back in the days when women weren’t allowed to be sailors unless they pulled some Mulan-type antics, many sailors would go months without seeing a woman. So, many men would get tattoos of women on their body as a reminder of what was waiting for them when they got ashore (because they forgot, I guess?) 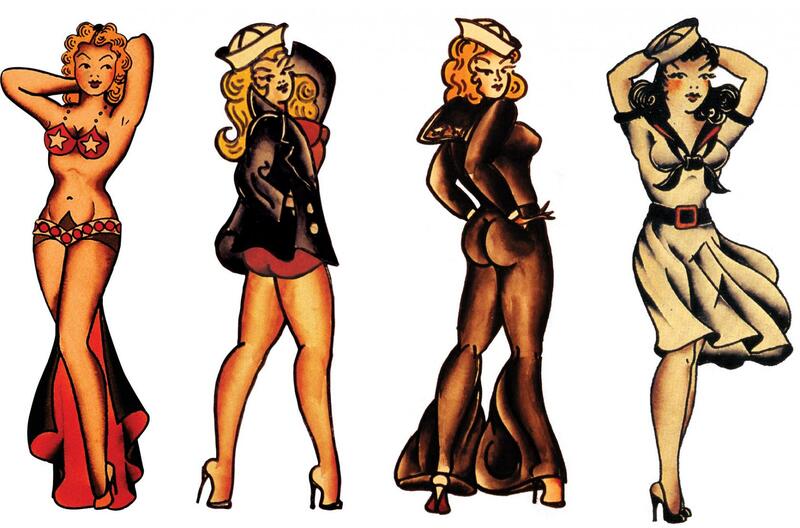 Many pin-ups are still modeled after Sailor Jerry’s original designs. Today, many people get pin-ups in the likeness of their significant others, though with the still high divorce rates, you better be sure you like the subject matter. 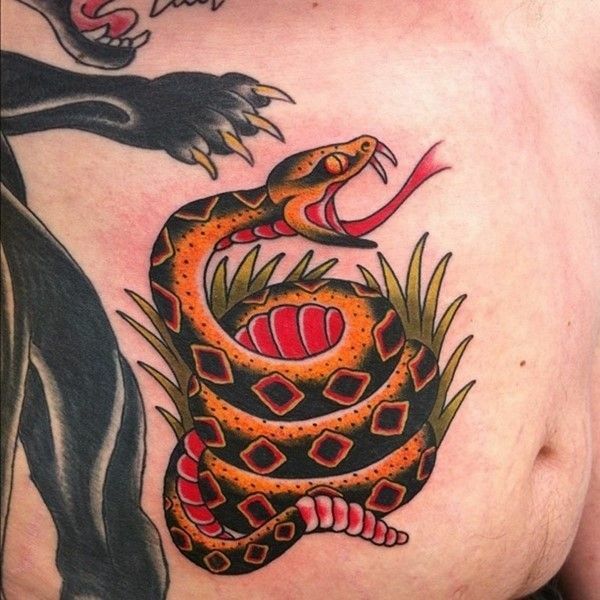 Often representations of potency and power, snakes are a popular tattoo subject for many traditionalists. Because the snake sheds its skin, many see it as a symbol of a new beginning. Others see it as a symbol of evil, thanks to its key role in the Christian Bible. But then there are some that get simply because it looks badass. Regardless of your choice of tattoo, it’s important to take care of them. The best way to do this is to use great, natural products, like Whiskey, Ink, and Lace’s tattoo care products. Applying the tattoo serum for the first 1-4 days after getting tattooed will keep the skin moisturized and helps with the heat of your irritated skin. Follow that up with the tattoo cream for a few weeks to keep the skin moisturized and keep the skin healthy. Available either individually or as a kit.